Provide metadata for your new web app. Do you want to build web mapping applications you can run on desktop, web, or mobile platforms without doing any programming? If so, this article is for you. 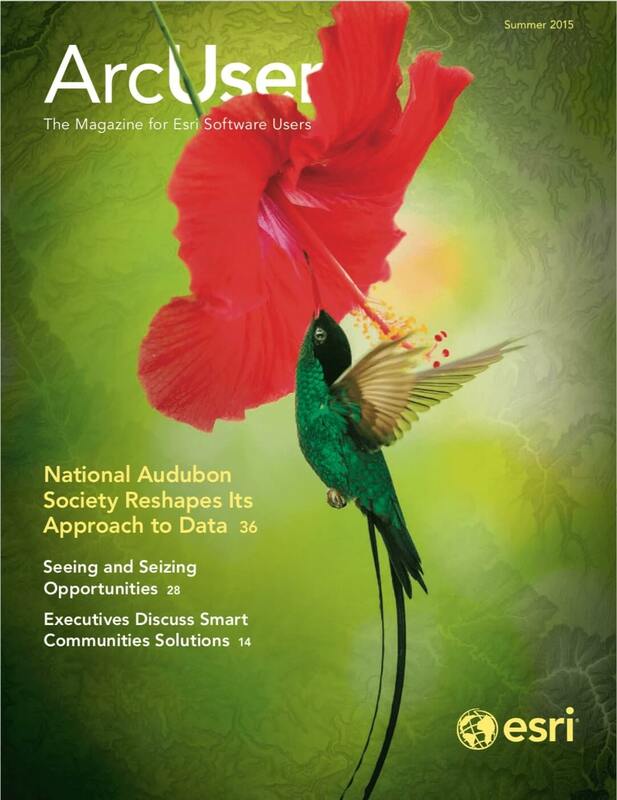 All you need is an ArcGIS Online or Portal for ArcGIS account. This article shows how to create a web mapping application based on a web map in ArcGIS Online or Portal for ArcGIS in just six steps without having to write a single line of code. Log in to your ArcGIS Online (or Portal for ArcGIS) account. Navigate to your My Content page and select a web map that you want to use in your web app. Open it in the map viewer. Click Share. In the Share dialog, select the group or groups you want to share the web map with, and then click Make a Web Application. 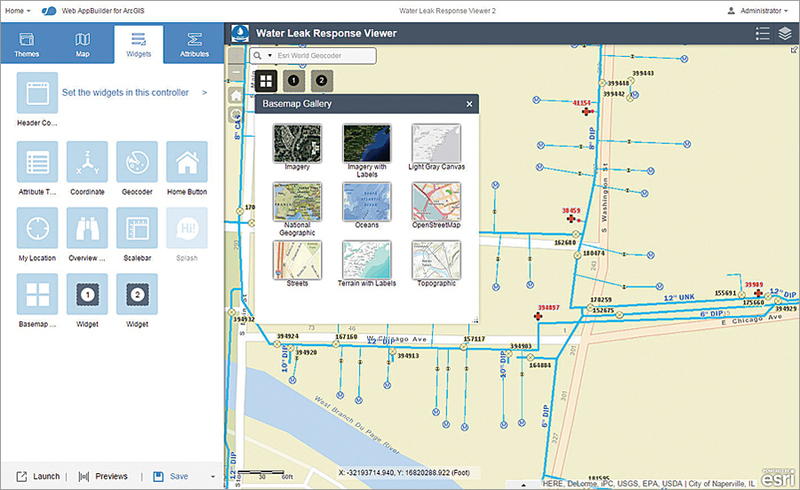 Web AppBuilder for ArcGIS provides a dynamic interface. As changes are made on the left panel, they will appear in the right panel of the preview window. In the Make a Web Application dialog, you will see that you could create a web app using the Web Application templates. 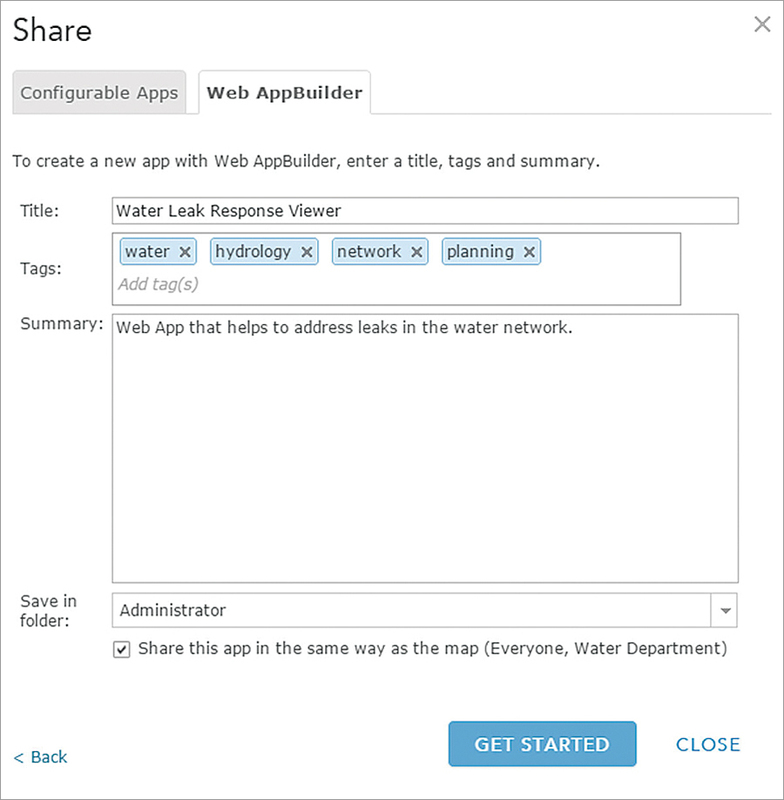 But in this case, click the Web AppBuilder tab to create a new web app in Web AppBuilder for ArcGIS. The Web AppBuilder for ArcGIS application layout is divided into two general sections. To the left are the different parameter settings you can enable and configure for your new web app. To the right is a live, WYSIWYG preview of how the web app will appear after you have configured parameters for the web app. Define the data, functionality, and appearance of your web app using the Web AppBuilder for ArcGIS configuration property tabs. Notice that the left section of the layout contains four tabs: Themes, Map, Widgets, and Attributes. These are the main areas where you can configure and customize your new web app. 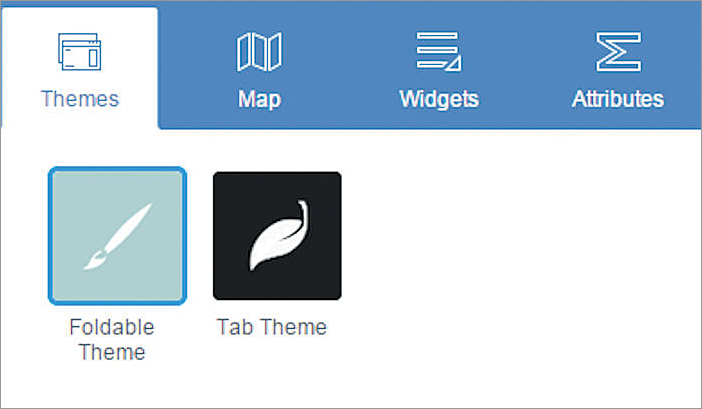 Both the Themes and Attributes tabs are for defining the look and feel of the web app. The Map tab defines the data content of the web app—in this case, it is the web map you selected. The Widgets tab allows you to set and configure the functionality in the new web app. When you make a change in the left section in one of the four tabs, it will be immediately visible (if applicable) and enabled in the right display preview section of Web AppBuilder for ArcGIS. This provides a very intuitive and user-friendly experience so you can see and try out the changes you just set for the web app. For example, if you were to add a new widget button to the app interface, it would appear in the app layout. Click the Themes tab. There are two default themes available: Foldable and Tab. First, click the Tab Theme button. You will notice that the app’s layout changes in the preview window on the right. Then click the Foldable Theme button. You will see that the app layout returns to the way it was. Note that each option also has its own unique style and layout options. Select a theme for your new web app along with a style and layout and then click Save in the lower part of the left section. You can change the data content in your web app by selecting a different web map. Next, Click the Attributes tab. On this tab, you can further refine the appearance of your web app. You can add a custom logo, title, and optional subtitle and web links for your web app. Add an appropriate title for your web app; click the Logo button to add your own custom logo; and add a subtitle and web links, if desired. Click Save when you are finished with your custom settings. Click the Map tab. On this tab, you can change the data content for your new web app by simply clicking the Choose Web Map button. In the Choose Web Map dialog, you will see all the web maps in My Content of your ArcGIS Online (or Portal for ArcGIS) account. You can also view the web maps that you can access in your organization, the groups you belong to, and public web maps. But you will use the web map you originally selected for this new web app; therefore, click Cancel. Select a widget from the Widgets tab. Define the different capabilities available in your new web app. Click the Widgets tab. This tab lists the different functionalities that you can add to your new web app. A widget is a chunk of code that enables functionality in web apps. By selecting and adding widgets, you enable different functionalities in the app. A best practice is to create web apps that meet a specific business workflow instead of generic apps that address multiple workflows. For example, you should create an app for editing parcels and a different one for collecting data from the field, instead of a single app that would do both. Preview the Basemap widget in Web AppBuilder for ArcGIS. Click Widget 1 on the Widgets tab to make the Choose Widget dialog appear. In this dialog, you can select the widget you want to add. Select the Basemap Gallery widget and click OK. Next, the widget’s configuration properties dialog appears—this is where you can further define the properties of the widget. Select the basemaps you want available and click OK to save your widget settings. The Basemap widget now appears in the app preview display. Click the Basemap widget in the preview window to see how it would work in the web app. If you need to add more widgets to the app, you can click the Header Controller widget at the top of the Widgets tab. It contains widgets in the app title bar. 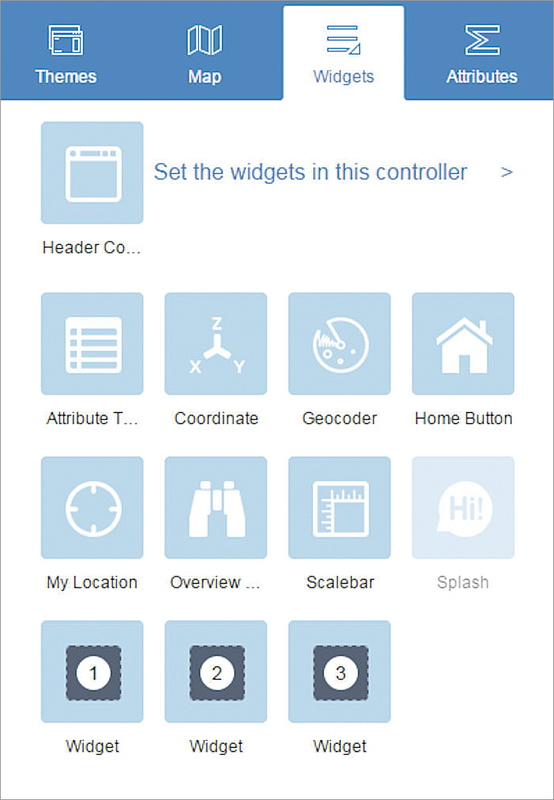 Web AppBuilder for ArcGIS includes more than 20 widgets. 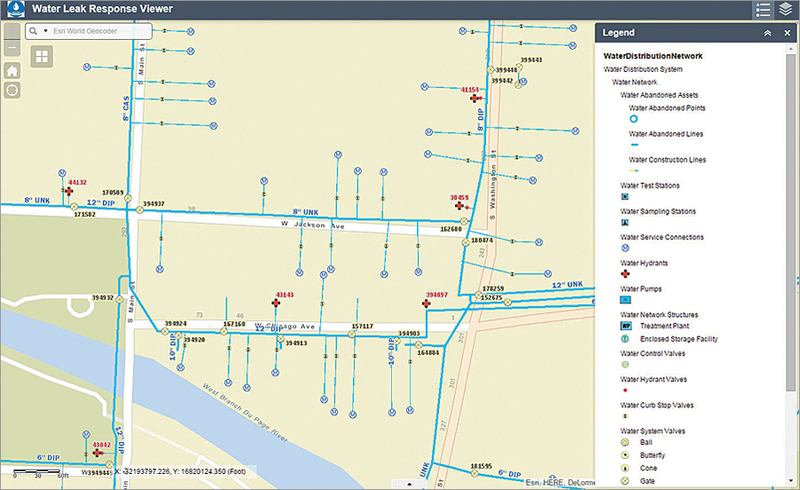 More widgets are added with each new ArcGIS Online and Portal for ArcGIS update. 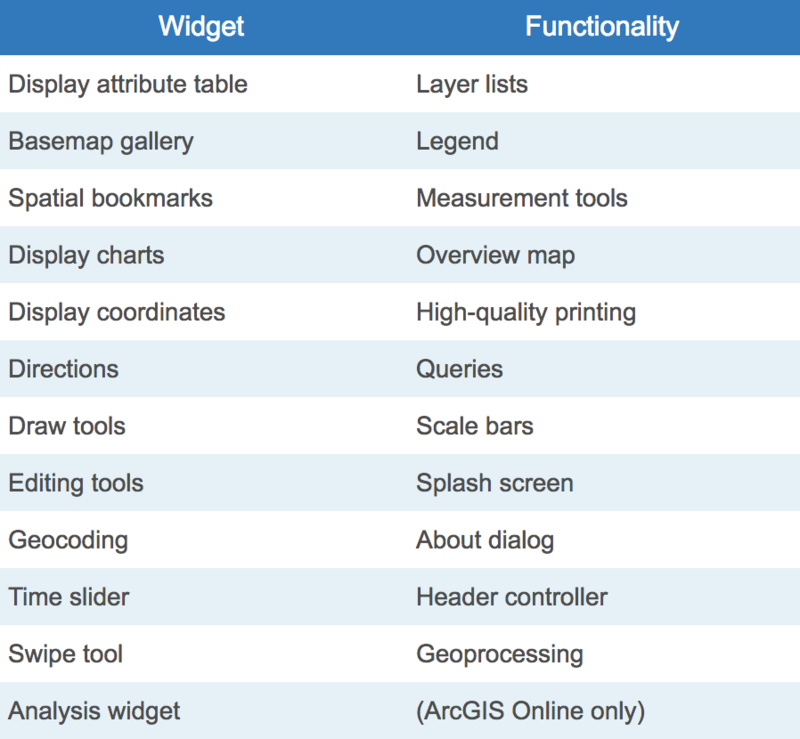 The widgets initially offered provide core functionalities typically found in GIS applications and are listed in Table 1. The complete list of available widgets and information on configuring widgets is available from the ArcGIS Online help. Select and add the widgets that would be appropriate for your new web app. Click Save when you are finished. You have now completed setting the appearance, data content, and functionality of your new web app. Your custom web app is complete and ready to use. 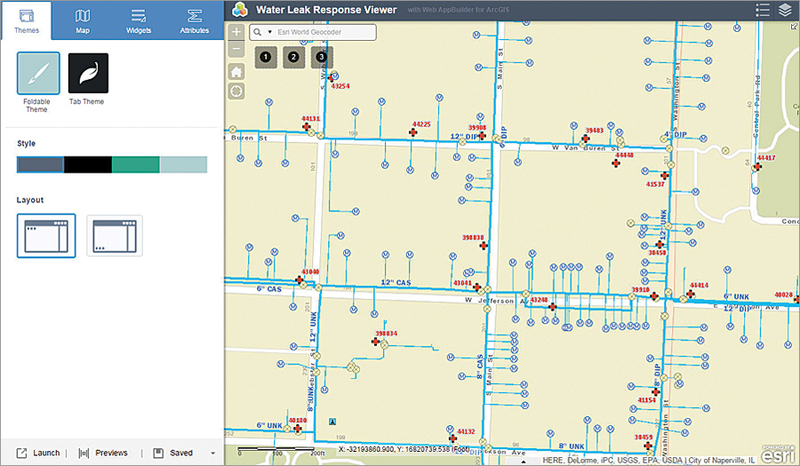 Here is an example of a finished web app created using Web AppBuilder for ArcGIS. Your new web app is saved in My Content. The web app becomes a new item and can be edited within the Web AppBuilder for ArcGIS builder environment at any time. It is now live and can be accessed by anyone you have shared it with. Click Launch at the bottom of the left-hand section to run your newly created web app in the web browser. At the bottom of the left-hand section, click the Previews button. 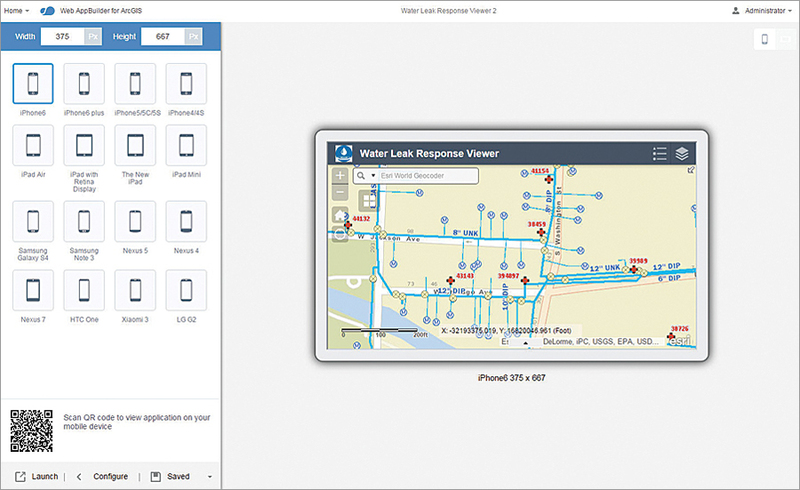 This changes the entire Web AppBuilder for ArcGIS display interface. On the left, a list of mobile devices is shown, and on the right is a preview of how the new web app will look in the selected device. Click Configure to return to the previous Web AppBuilder for ArcGIS interface when you are done. You can preview how the app will look on an iPhone 6 or other devices.